To create the dough in a stainless steel or glass bowl stir together the yeast, warm water (not boiling) and honey. Cover with a clean kitchen towel and let sit 20 minutes. Add flour, sea salt, and olive oil first mixing with a spatula and then folding with your hands and kneading for up to 10 minutes. Place ball of dough at bottom of bowl again, thinly drizzle with olive oil and cover again. Let sit again another 20 minutes and in this time preheat oven to 425. Oil your cast iron. In a separate skillet or frying pan add 1-2 tablespoons of olive oil and stir fry the onion. 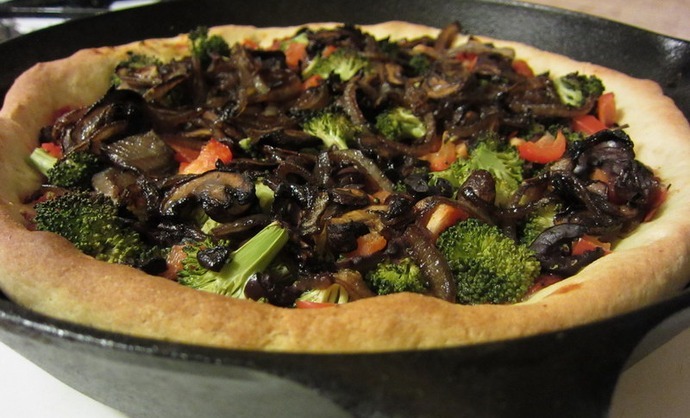 Was fragrant and turning translucent douse with 1/4 cup of balsamic vinegar and add mushrooms. Caramelize for 15 minutes. Once dough has risen, punch down and knead again. Roll out or punch out in the air with your hands. For this I start a pinch pot and stretch. Eventually you can use your fists to separate. 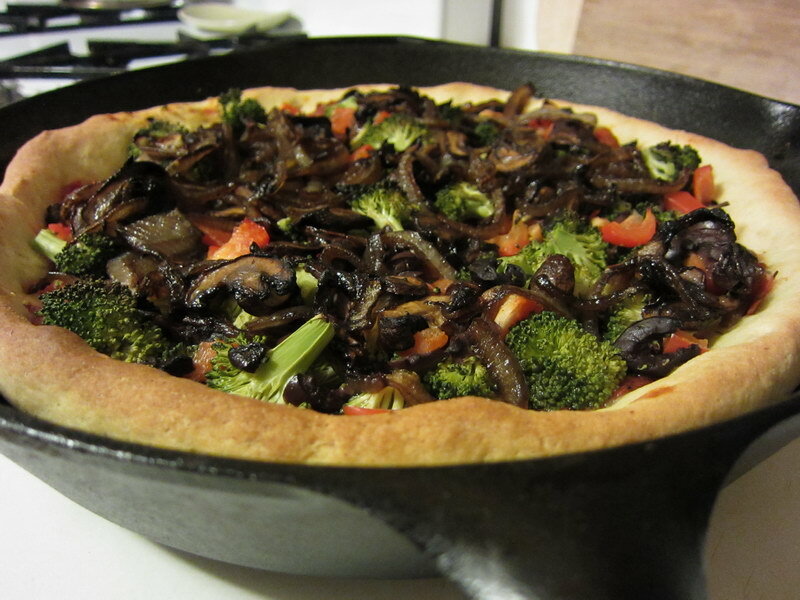 Then put in cast iron skillet and press out to fit your skillet, pinching up the deep lip of the skillet. Top your dough in this exact order: 14.5 oz can organic Fire Roasted Crushed Tomatoes, spooning just enough to comfortably coat (may not actually use all of the can). Season and sprinkle on sea salt, ground pepper, dry basil, oregano, thyme, and a pinch of fennel seeds. Then broccoli (this close proximity to the tomatoes will steam and cook the broccoli), kalamata olives, red pepper, and cover with caramelized onions. Bake for 22-25 minutes. Dough will be golden. Pizza can be slid out onto a cutting board.